The new school year will start earlier than you think. The Bossier Parish School Board recently approved the 2017-2018 school calendar, which has students returning to the classroom Aug. 2. Only nine weeks will separate the end of the current school year and the new one. Bossier Parish teachers were presented two calendar options to vote on. Calendar A, which the board approved, had an earlier start day and includes a week break in October. 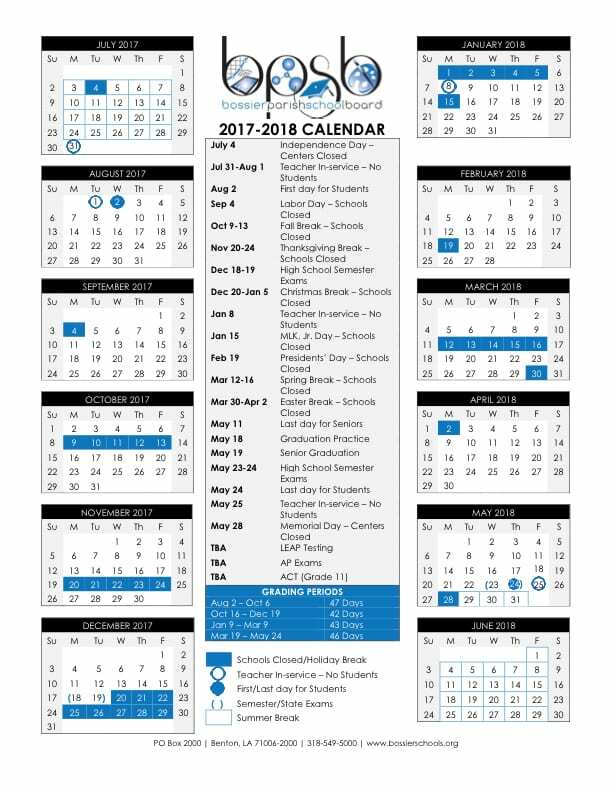 Calendar B mirrors the current school calendar. Mitch Downey, Assistant Superintendent of Bossier Schools, said 72-percent of the 1,096 votes were for Calendar A. Comments made about this option, Downey said, was in regards to the week off in October. That break, however, was a concern for several school board members. Brad Bockhaus (Dist. 2) voted against the teachers, the first time he’s done so in his eight years on the board. Downey said a seven year study was conducted to compare the average temperature between the months of July and September. He said the study shows, on average, a single degree difference per month during for that time period. Downey added that there’s no route over 12 miles long on a non air conditioned bus. “I haven’t been directly involved with this prior to, but we’ve done our homework and did a tremendous amount of research to address every issue,” Downey told the board. There was still some concern amongst the board. Shane Cheatham (Dist. 11) spoke against the week off in October. He said it will be a burden on parents to have to find childcare. Eric Neuman (Dist. 9) agreed with Cheatham. Downey assured the board that a lot of time and research went into creating the new calendar. Calendar A was approved by the school board by a 9-3 vote. Downey said the calendar will be good for one school year. The board will have to vote and approve a 2018-2019 calendar next year. The school board’s vote wasn’t close. 9-3. From what my friend told me who is a good friend of the wife of the former school board president is that he voted against it since one of his kids will be in California that week playing softball. So much for impartial decisions. NOT. And coming from someone who has never been an educator. Parents don’t take the whole summer off either. I really don’t see the difference. There isn’t any. Some people just have to complain. My issue with this is that not everyone will really get a ‘fall break’, especially high school athletes, band members, cheer, dance, etc. Football games and associated practices will still be ongoing. For parents who work 8-5 having to still get kids to school for practices at odd times during the day and then back home without usual transportation could be an issue. Most work schedules are not structured around this week off either, so being able to take a real fall break vs just leaving your kids at home or daycare could be an issue for many. It’s difficult to make everyone happy with major scheduling changes but input from working parents and/or parents who have children involved in school activities would have been beneficial. And maybe discussing these ideas then implementing a year or two down the road would help families prepare as well. Spring break is in the middle of baseball and softball season and their practices and games go on. Haven’t heard people griping about that. Laura I have – for the last 4 years as it has affected me and my children as well. BUT….we knew about it way in advance. We knew in middle school that our lives would be affected by that and adjusted accordingly. This is one of my points – if the change is to be made, maybe give parents, students, teachers, coaches, even employers ample time to adjust to the changes. That’s all. Lisa Landry Mathews I understand but all of the above have several months to prepare. I have kids who play sports. 7 months isn’t enough lead time? Most businesses have planned their 2017 calendar year already and parents have already put in for vacation days and time off. It’s getting harder and harder to find a week of vacation during the summer anyway between summer sports workouts, band camp, dance camp, etc. I am a small business owner with kids in football, band, softball, baseball….so I know the importance of preplanning. It’s not in my budget to take off another week in October at this time. If it began next year it could be budgeted better, both time and cost wise. I’ve heard many parents of younger children discussing the additional fees involved with childcare and/or having to restructure vacation time to make this additional week work. Just my two cents as a taxpayer. Mike not when most businesses plan their yearly calendars in 2016 for 2017. That’s crazy…..they moving closer and closer to year around school. Curious to what the total count was of votes. Teachers are not the only people that votes on calendar. Awesome. Now I can take a winter vacation when it’s cheaper then a summer vacation. And tourist places are much less crowded than in the Summer when most schools are in session. Good grief! Calm down, people! The administration and school board members should have to ride in a school bus everyday the whole month of August to see what the children have to endure with this schedule. I agree about the heat at the beginning of the school year. But this schedule’s very close to the same schedule that has been in place for many years. 1 week’s difference. Perhaps instead of complaining about the schedule, we should be lobbying for funding for all air conditioned buses. It’s not that I disagree with the after Labor Day start. But that hasn’t happened in decades. One week earlier is not going to be a big difference from what the norm has been for many, many years. Desoto Parish has had this schedule with a whole week off in October for years and everyone’s happy. Check this out, Melanie Cain Roberts. Crazy! Year round school is great. Nine weeks on, three weeks off. This is super! Closer to year-round school. So this is more time my son will spend on the bus in the heat of the summer on his hour long bus ride. It is not going to be any more hot 1 week earlier than the previous years’ start dates. But why put kids (and drivers/paras) in it longer. Buses get hot. Labor Day until Memorial Day. Get rid of holidays except Thanksgiving, Christmas, Spring Break/Easter, like it was. Kids acted better, teachers were happier, parents were happier. The days leading up to holidays are wasted, everybody’s mind is on the break. That’s a lot of week-long breaks. Nearly 3 weeks at Christmas. I’m sure that the daycares will be more than willing to take all the kids in they won’t have them the first few days of August. Laura Logan doubt it’s that easy financially for these parents. Regardless, Summer isn’t Summer anymore! They may as well go year round! They don’t get out until the end of May?! I’m looking for a job where I get paid to go on vacation. It’s ridiculous you think they even get paid enough! Krissy Phillips who said “they” get paid enough and who are the “they” you’re referring to?! Heat is already an issue when school has started for years. The thing is a few days earlier isn’t any more hot. It won’t get any cooler until September. Zandra Morris Ashley It won’t cost more money for parents because the parents will be paying for 1 less week at the end of Summer. Daycares will adjust the prices so it will come out the same. I take it you’re an educator? You have kids in daycare? Or tried to get your kids into a daycare or on a waiting list? Not considering the reason teachers have a job….is thoughtless and wrong in my opinion! If it weren’t for the parents and their kids, they wouldn’t have a job! So, YES! All of the inconvenience placed on parents should have been at least voiced! Period! Laura Logan so you agree heat will continue to be an issue ? ?because this winter is a clear indication that heat will be an issue! Wow Zandra you can take your anger against teachers elsewhere. We bust our tails off all school-year and let me be clear, the summer isn’t a completely free time for teachers to do absolutely nothing! Zandra Morris Ashley where in the world did I EVER say anything to remotely suggest that I have disdain for concerned parents? Don’t put words in my mouth. And what am I supposed to feel guilt about? Amanda Saunders Smith exactly ? I don’t even teach or live in Bossier but I’m from there and all I can say is creating a school calendar isn’t easy and no matter what, someone is always going to complain. I’m sorry you don’t like the calendar, but it could be worse. Where I teach we will be starting in mid August and ending the first week of June. Y’all are lucky to be out around Memorial Day. Zandra Morris Ashley your argument is stupid. Exactly what? Amanda Saunders Smith Lucky?? I don’t care for the calendar. Never said it was an easy job but you know what makes it harder? Excluding the parents! I would rather my child enjoy his Summer. Zandra Morris Ashley I get the point of having kids enjoy summer because they’re only kids once. I suggest voicing your opinion to the school board then. Maybe for next year’s calendar they’ll ask for parent input. Zandra Morris Ashley nope no guilt. Just a teacher who is sick and tired of people complaining teachers don’t have sympathy for kids or parents. Or thinking we get paid to “go on vacation”. Amanda Saunders Smith there’s a bad apple in every bunch! I know personally. You don’t define what a teacher is for everyone. Zandra Morris Ashley thank you I appreciate that. Zandra Morris Ashley So going back ONE week early will ruin your child’s Summer? Or is it just that’s it’s a tad more inconvenient for YOU? Lots of families are going to take advantage of that week in October for a vacation that isn’t in the middle of the hot Summer. Laura Logan YES! Going back early means less time during the Summer. It’s obviously more convenient for YOU to be off in October. I’m a stay-at-home mom and I home school one of my kids! ? This is called empathy for the parents who don’t have the luxury to take off for a vacation or funds to pay for a sitter. We can keep going back and forth but what will it change??? Nothing! So they get HOW MANY weeks off with pay?! Smh! Funny, no parents commented or decided! Shannon Dowling Bothel when did I say anything about an increase in pay? Did teachers choose how long our children will have to enjoy a Summer vacation? Yes! Did teachers decide for us rather a week off in October were convenient or not? Yes! Are teachers off more this coming year with the same pay? Yes! Lol I worked for BPSB and my mom works in this system and has for over 20 years. Are they paid even if they’re out on holidays? Yes! Are the parents? No! ? It’s the same number of day in school as before. No one is working less for the same pay. Ronnie Peterson so why do we need a week out in October? why are our kids going back August 2nd? Why aren’t they out until the end of May? Teachers don’t get a SINGLE day OFF WITH pay! Not even Christmas Day. They are paid for the days they work ONLY! Our pay is spread out over 12 months, but we are NOT a paid for one day OFF ever! Jodi Mays Burr and all other TEACHERS! I’m entitled to my opinion because it doesn’t effect YOU! But for some reason YOUR opinion effects all 20,000 + parents! THATS the problem! Teachers aren’t paid for holidays? Vacation? You don’t get paid during the Summer but you are paid during the school year! Even when out on Holidays! The week you’re out in October….you won’t be paid? What’s the welcome back checks for??? ? Zandra Morris Ashley I could care less about your OPINION. What a care about is your lack of FACTS! No, teachers aren’t paid for one single holiday or vacation day. We are paid a daily rate of pay to work a set number of days and our salaries are simply spread out over 12 months. Our Welcome Back checks are a part of our salary for working that set number of days that is then pulled out and distributed to us at the beginning of the school year to offset the delay in a new teacher starting to work and having wait nearly two months for a paycheck since we are paid monthly. Four: thanks for the information, doesn’t change the fact that our kids Summer vacation has been taken ? So a first year teacher ( 2014-15 posted online scale) makes 40,098 a year so if you only count days in the class room they work 276 days ( current year schedule) that’s 39.4 weeks so if we round down to 39 weeks a year the first year teacher makes 1028.15 a week or 18 an hour. If I worked 52 weeks at the same salary I’d make $13 an hour. Same numbers for a 25 year teacher making 52,443 a year salary breaks down to $24 an hour. If you count just the days in classroom and don’t count the holiday time off. If I worked the same for 52 weeks I’d make $18 an hour. Now as a teacher your going to see it one way I’m sure but the next time teachers are asking for a raise the administration that approves such raises will see the numbers I posted for days in class and compare that to jobs that earn the same equivalent pay. $13 an hour on paper looks different than $18 on paper. I say teachers need a raise or help in the classroom as I think it would benefit the students but I’ll say this using those same averages is how they determined the temperature in Aug and Sept is the same. But they can’t predict the future or the temp for this Aug and September. We shall see when we get there! Jodi Mays Burr No, you were a bit upset. When did I state you are paid full salary for anytime off??? A statement to my husband has nothing to do with you. Parents should have a say regardless to how simple it seems. Our kids are the reasons you have a job honestly. I don’t know many people anxious to go on a winter vacation, Summer??? Yes! The Summer vacation is shorter and shorter each year and for ME and many other PARENTS that’s a problem! Trust me, parents would rather not pay an extra week of daycare just to pay bills not for vacation. Darren Ashley thank you for proving my point. There aren’t many college educated professionals who would work for $13-$18 an hour! Not to mention the untold number of extra hours educators put in outside of the school day nor the amount of our personal money we pour back into our students. I could see if the upset if the issue was more time off with the same pay. That’s not the case. Jodi Mays Burr I think your missing my point of why they won’t give you a raise, but feel free to keep thinking I proved your point. You don’t make 13-18 dollars an hour because you don’t work but 270 days a year but that same first year teacher is making 40K or $18 an hour for part time work or 39 weeks a year. I’m not most people but most people especially on FB would tell you to get another job: part time, or a different profession and not complain about your pay for the job you picked to spend an education on. No as a parent who works 52 weeks a year I don’t get to take off work in October because you decided it would be good to get a break after the first nine weeks of school. I get two weeks a year if I use one during Christmas time spread out to keep my kids and not pay 100+ per week per kid for day care the other is for a summer vacation. I don’t have a spare week to take off in October. Zandra Morris Ashley Interesting that you presume to know my emotional state. Here’s the answer to your question about when you stated that we are paid for time off. Jodi Mays Burr right….with the ? So…. Jodi Mays Burr I don’t KNOW your emotional state. I know you’re back and forth with me on FB over an opinion that has nothing to do with you ? Zandra Morris Ashley yes, ma’am, it does. You are on a public post. My intended purpose is to clear up your “head shaking” insinuating that teachers get weeks OFF with pay! Jodi Mays Burr SMH lol thanks for all your hard work that changed nothing! I hope you feel accomplished ?? Try this link to see how good teachers have it. Zandra Morris Ashley As an educator, it really upsets me that you think we don’t think every second of every day about your kids. You don’t know me just as I don’t know you so please don’t assume that we were not thinking of your kids when we voted for this. Kids need mind breaks just as much as we do. It is literally a week earlier and we are getting out quite literally on the same day that we are getting out this year. As for your comment about being paid to have vacation, we don’t get real summer breaks. We are at workshops and in our classrooms preparing lessons for YOUR kids. I have 177 kids that I consider my own. Every decision I make in regards to school is with them in mind. I don’t take a break from that. I don’t leave my work at home. I cry and laugh and have every other emotion on a daily basis because I love my kids. THAT is why I chose option A. Education is not the same today as it was even when I was in middle school. These kids need time to rest their brains and come back refreshed and ready to learn. You are complaining about the parents issues, have you thought about the kids? You don’t understand how hard it is to go 4 months without any sort of substantial break for the students AND the teachers. We don’t have normal jobs. We don’t work 9-5 with an hour long lunch break. We don’t get to walk away at the end of the day and show up the next day ready to go. We are always working. You have your kids in the best parish in the area. You should feel blessed to have the amazing teachers that your kids have. Treat them right or you’ll lose them. Darren Ashley that’s assuming we only work from 7:20-2:25. I wish!!! No I did the math one time and took all of the hours that I actually work (after school and school functions) and we make less than $10 an hour. Our jobs aren’t bell to bell. Rachel Elizabeth Smith lol well as a salaried employee and how labor law works your argument is mute. I work in a profession where there is no overtime either and if you consider when I’m on call or running in he middle of the night to my job I’m not making my salary break down per hour either. I’m sure nobody would be, my point was a teacher said “we don’t get paid for the holiday time off” so my breakdown was for the time in the classroom. So my times are accurate for what I stated them to be the time in the classroom. I’m glad your a teacher I’ve taught myself in the past and enjoyed teaching, I’ll be honest though I don’t have to like the calendar the teachers voted on, I don’t have to like the week off in October. But you can’t tell me what it’s like to teach and have the students learn at a high level when I’ve been there before. If you’ve never been in a classroom with 177 sixth graders in a day then you cannot say that you’ve been there before. Im not belittling your job, I am trying to stop you from belittling mine and the amazing work that I do for the kids in this parish. But thank you. I most definitely will enjoy my new calendar, as will my students. As you know, those are the ones who truly matter. Have a wonderful evening and God bless. Kids don’t even have a summer anymore…smh!! They have the same exact amount of time off. Jody Wroten Yes they do get the same amount of time off. It’s just broken up differently. There is a mandatory number of days that they have to go to school. That has not changed. It’s the same number of days off and in school. Just moved around the calendar. The day cares will adjust. Parents did get a vote.